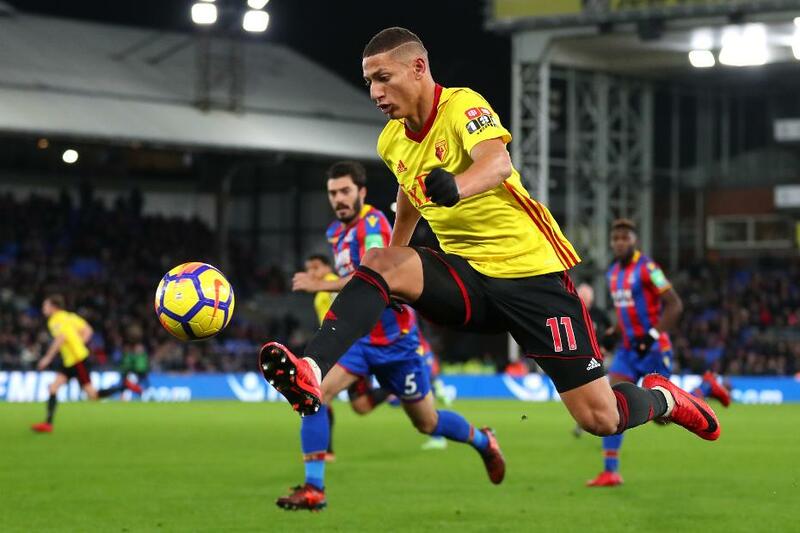 Richarlison (£6.5m) can break an eight-match spell without a goal when Swansea City visit Watford on Saturday. Having lost almost 140,000 FPL owners since Gameweek 18, the Brazilian will carry the threat to a Swansea defence who have allowed 58 shots on target in away matches. Only West Ham United (63) have conceded more. The Watford midfielder takes his place in The Scout’s best XI for Gameweek 21, which reverts to a familiar 4-4-2. 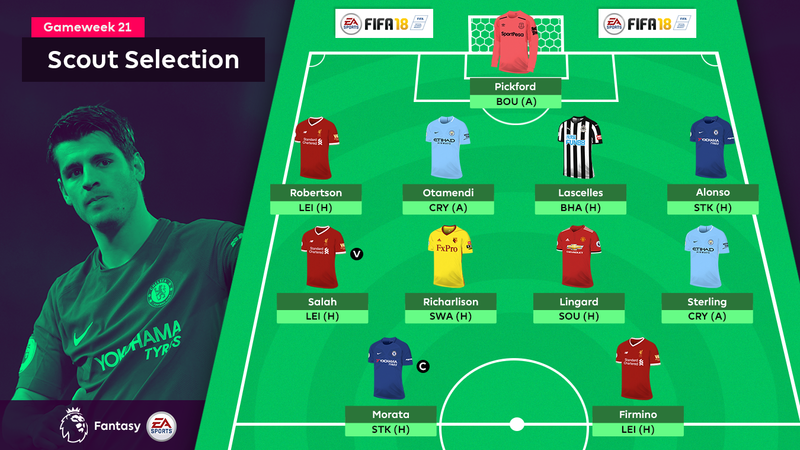 Heading to AFC Bournemouth as FPL’s outstanding goalkeeper on current form, Pickford has supplied five clean sheets and 11 bonus points from his last seven Gameweeks, amassing 7.8 points per match. Now the top-ranked defender on 110 points, Alonso entertains Stoke City on the back of successive 14-point scores from his previous two home matches. Second only to Alonso for goals from defence with four, Otamendi also picked up a third clean sheet in four Gameweeks in Wednesday’s 1-0 victory at Newcastle United. He travels to Crystal Palace having earned more bonus points (14) than any other FPL defender. Liverpool will face Leicester City at Anfield having conceded just three goals in 10 home matches, fewer than any other side. Robertson has made six starts in the back four since Gameweek 15, supplying the most crosses among his team in 23. Saturday’s visit by Brighton & Hove Albion offers the opportunity to end Newcastle's run of 11 matches without a clean sheet. Brighton have not scored in their last four away trips and have just a single goal from their previous five matches overall. With a goal or an assist in 11 of his last 12 Gameweeks, it seems unthinkable to ignore Salah, regardless of his opponent. The Egyptian will face Leicester City on Saturday having fired 45 shots in home matches, a tally bettered only by the 70 by Harry Kane (£12.9m). Revelling in the No 10 role for Manchester United, Lingard is set to earn a recall, after a brace from the bench against Burnley last time out. Over the last seven Gameweeks, no player has produced more points than Lingard’s 60. That has been reflected in the FPL market, with only Roberto Firmino (£8.9m) earning more new owners ahead of Gameweek 21. The Brazilian last found the net back in Gameweek 12, although his 20 shots from inside the area over that spell is bettered only by Salah’s 24 among FPL midfielders. Richarlison started as Watford’s central striker against Leicester last time out and could lead the attack again when Swansea visit. Like Salah, it is almost impossible to overlook Sterling on current form. With four goals in his last three Gameweeks, the Man City winger is second only to the Liverpool man in the overall standings. Lined up for his 11th successive Gameweek start, he will provide the major threat to Crystal Palace at Selhurst Park. The most-signed player ahead of Saturday’s 14:00 GMT deadline, claiming over 243,000 new owners, Firmino takes on Leicester at Anfield on the back of three successive double-figure scores. The Spaniard faces Stoke at Stamford Bridge after a hat-trick against them in Gameweek 6. Stoke have conceded 41 goals, more than any other side, and are without both Kurt Zouma (£5.4m) and Ryan Shawcross (£4.8m) in defence. We are backing Morata to get close to repeating his 17-point haul from the reverse fixture, and he claims our Gameweek captaincy.